gabby sews: Awesome July Stamp Special! Hi all! I've been so busy that I haven't had a chance to post some of my latest projects - lots of cards, several 3D projects, some bible journaling, and even a pocket letter! But I wanted to jump in before the month was too far gone to let you know about a special that is really great. Have you ever wanted one of the Close To My Heart hostess stamp sets but didn't want to actually be a hostess? Then this special is for you! 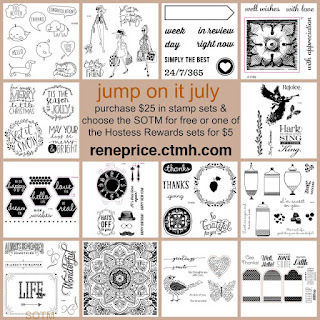 For every $25 in stamps that you purchase you can purchase one of the hostess stamp sets for $5! Or...if you prefer, you can get the July Stamp of the Month for free. You can contact me for more information or go directly to my online store to place your order. Once you put at least $25 worth of stamps in your basket the system will let you know that you qualify for the Jump On It July special. I'll be back soon to share some new creations and more information on the new Close To My Heart catalog coming out in September - it includes a brand new Cricut cartridge! !